"Simple, tasty and fast! Salmon is sauteed with all ingredients at once, and served over couscous. Great with a spinach salad." Heat the butter and olive oil in a large skillet over medium heat. Place salmon in the skillet, and season with garlic, lemon pepper and salt. Pour 1/4 cup water around salmon. Place tomatoes and cilantro in the skillet. Cover, and cook 15 minutes, or until fish is easily flaked with a fork. Bring 2 cups water to boil in a pot. Remove form heat, and mix in couscous. Cover, and let sit 5 minutes. 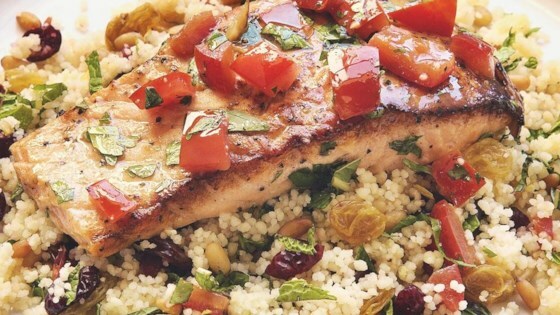 Serve the cooked salmon over couscous, and drizzle with sauce from skillet. Easy fast delicious recipe. No cous cous. The left over sauce is delicious over mash potatoes. This was so simple to cook, and very good. There wasn't much sauce for me to use in the end. And I added some cayenne pepper for a little spice. This is a great recipe! The cilantro adds a great flavor. It is very spicy. I think I will cut back on the lemon-pepper quite a bit but I will definitely be making this again!